This is just in direct from the "ZAPPERS" Coffee Mess. This is the 'gold-bordered' version of the 50th Anniversary patch created for VAQ-130. It says "EST 1968" and "50 YEARS" along the bottom in gold thread. This patch does not come with velcro attached. This is just in direct from the "ZAPPERS" Coffee Mess. 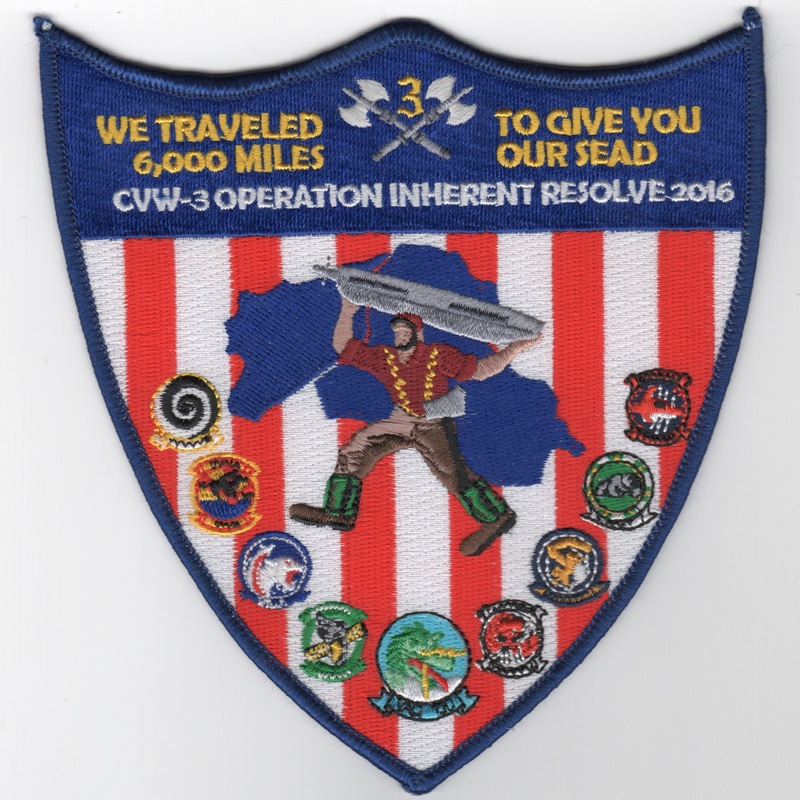 This is the 2016 OIR/SEAD cruise patch that says "WE TRAVELED 6,000 MILES TO GIVE YOU OUR SEAD". It shows all the squadron insignias of Airwing 3. This patch does not come with velcro attached. 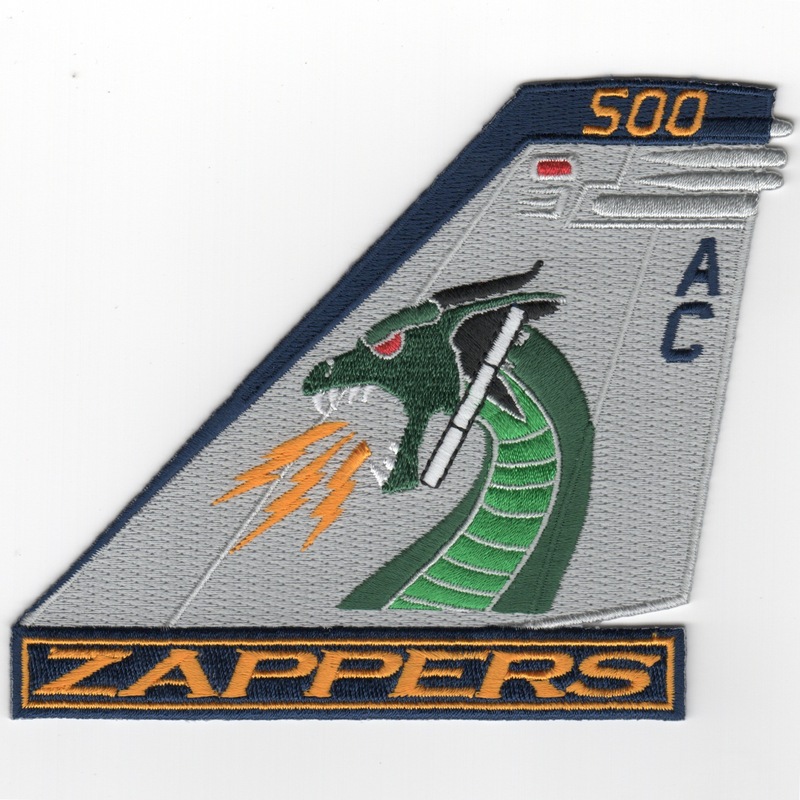 This is the "ZAPPERS" E/A-18G 'Growler' Tailfin patch created by AV8RSTUFF for them. This patch does not come with velcro attached. This is the large version of one of the cruise patches from VAQ-130 while onboard the Harry S. Truman's OIF voyage in 2003. CVW-3 was attached onboard, and the patch states "Liberty or Death". It shows the CVW-3 hand dropping a dumb bomb on Iraq. This is the small version of one of the cruise patches from VAQ-130 while onboard the Harry S. Truman's OIF voyage in 2003. CVW-3 was attached onboard, and the patch states "Liberty or Death". It shows the CVW-3 hand dropping a dumb bomb on Iraq. This is the "Don't Tread on Me" patch from VAQ-130 while onboard the Harry S. Truman's OIF voyage in 2003. Probably one of the most famous designs for patches in the Military. This is the deployment patch created for the VAQ-130 EA-6B squadron onboard the USS Harry S. Truman (CVN-76). It says 'Back to Iraq' OIF 2003. 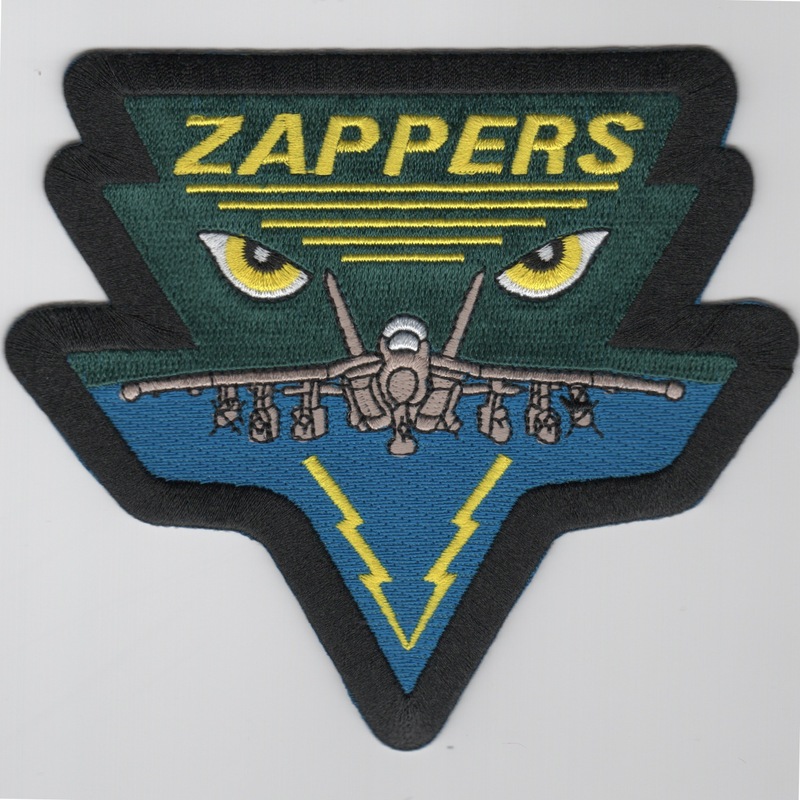 This is the desert version of the 2005 "OIF CRUISE" patch for the VF-32 Swordsmen and the VAQ-130 "Zappers". It was for their participation in Operation Iraqi Freedom from the Arabian Gulf. It shows the country of IRAQ in desert colors with the aircraft shown in the "head-on" configuration. Yet another must have patch!! 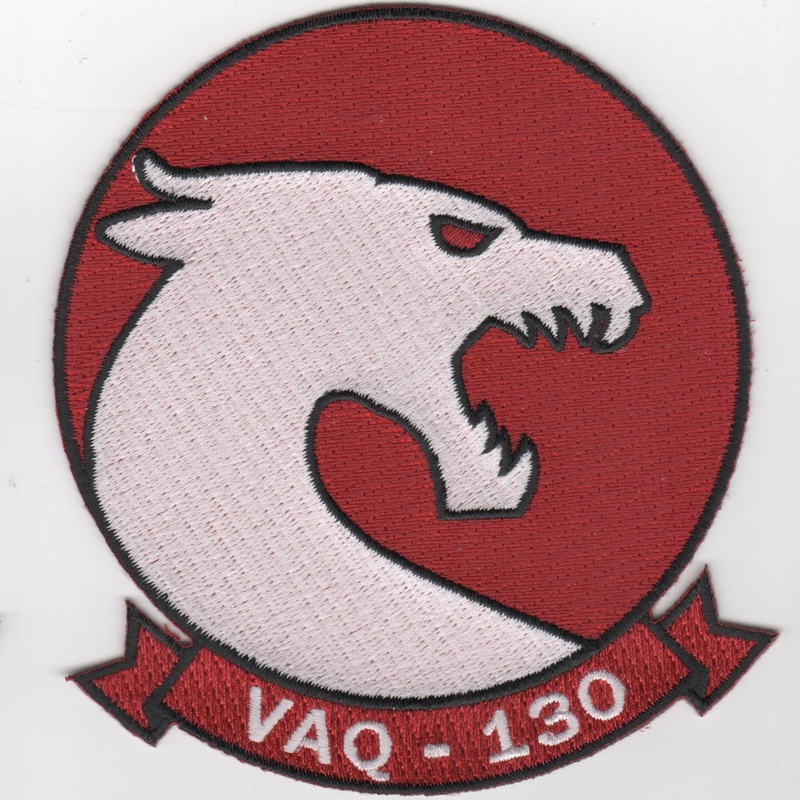 This patch was created by VAQ-130, and I think it commemmorates their early years as VAW-13. This is the Det-31 patch for the WestPac '68 tour in Vietnam. 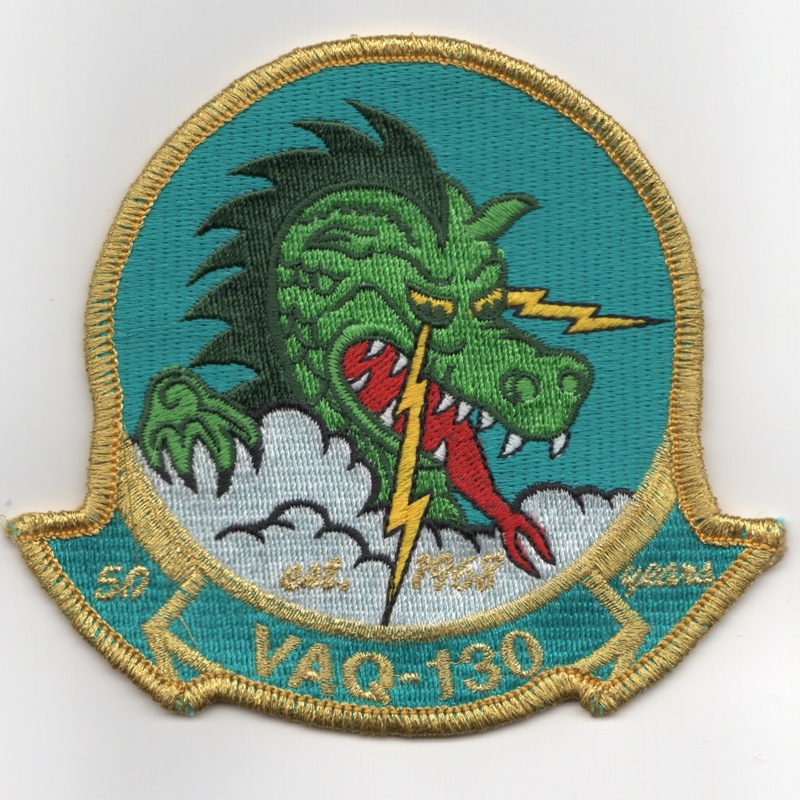 VAW-13 and all of its detachments were redesignated as VAQ-130 on 1 October 1968, so this patch is a commemorative of its ancestor. The Det numbers were the carrier hull number, so the Det patch chosen for this commemorative was aboard Bon Homme Richard for her 1968 WestPac cruise. 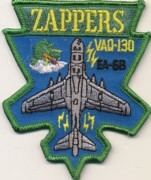 The 'Zappers' of VAQ-130 were established as VW-13 in September 1959. They were given their current designation in October 1968 and were the first squadron to operate the Grumman EA-6B Prowler. They fly out of NAS Whidbey Island, WA and were aboard the USS Kennedy (CV-67) with CVW-3 during the Persian Gulf War. This is the color version of the current squadron patch. The 'Zappers' of VAQ-130 were established as VW-13 in September 1959. They were given their current designation in October 1968 and were the first squadron to operate the Grumman EA-6B Prowler. They fly out of NAS Whidbey Island, WA and were aboard the USS Kennedy (CV-67) with CVW-3 during the Persian Gulf War. This is the desert version of the current squadron patch. The 'Zappers' of VAQ-130 were established as VW-13 in September 1959. They were given their current designation in October 1968 and were the first squadron to operate the Grumman EA-6B Prowler. They fly out of NAS Whidbey Island, WA and were aboard the USS Kennedy (CV-67) with CVW-3 during the Persian Gulf War. This is the subdued version of the current squadron patch. This is from the the Zappers and shows their mascot on a red background. Haven't heard the story behind this one yet, so if you know, please advise. It does not come with velcro attached. This is an aircraft triangle patch from VAQ-130. It is an upside triangle with an EA-6B top view on it. It also has the dragon in the upper left corner and says "ZAPPERS" across the top. 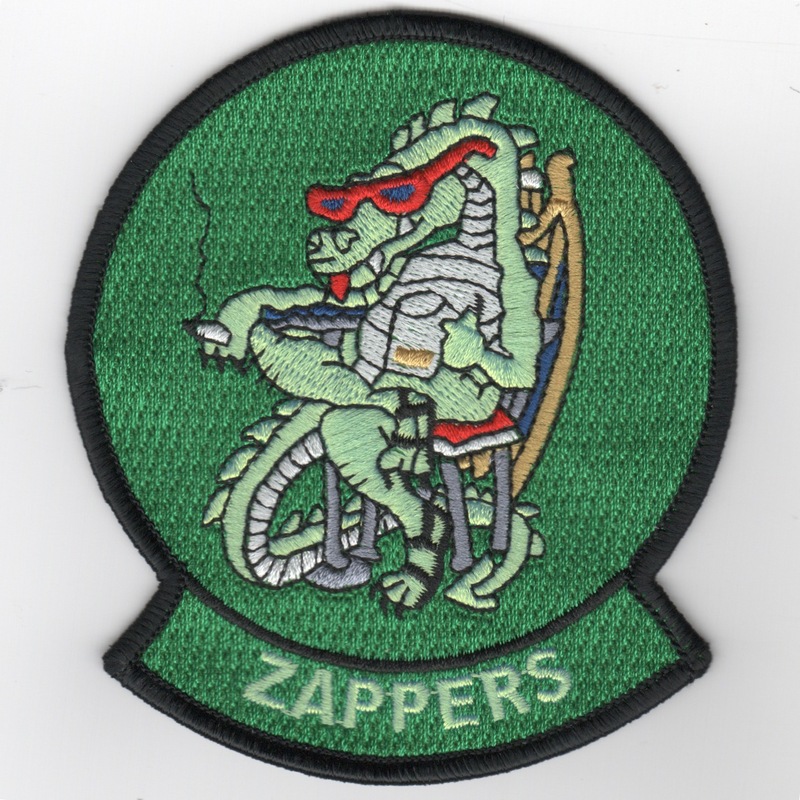 This is the 'Friday' patch worn by the VAQ-130 'Zappers' showing the mascot "chilling" with a beer and cigar in a "Ready Room" chair....this patch does not have velcro attached. This is the 'Friday' patch worn by the VAQ-130 'Zappers' showing the mascot "chilling" with a beer and cigar in a "Ready Room" chair....this patch does have velcro already attached. This is the new E/A-18 Growler aircraft triangle patch for the VAQ-130 'Zappers' showing the front view of the aircraft. It has the (simulated) leather border all the way around the patch and does not come with velcro already attached. 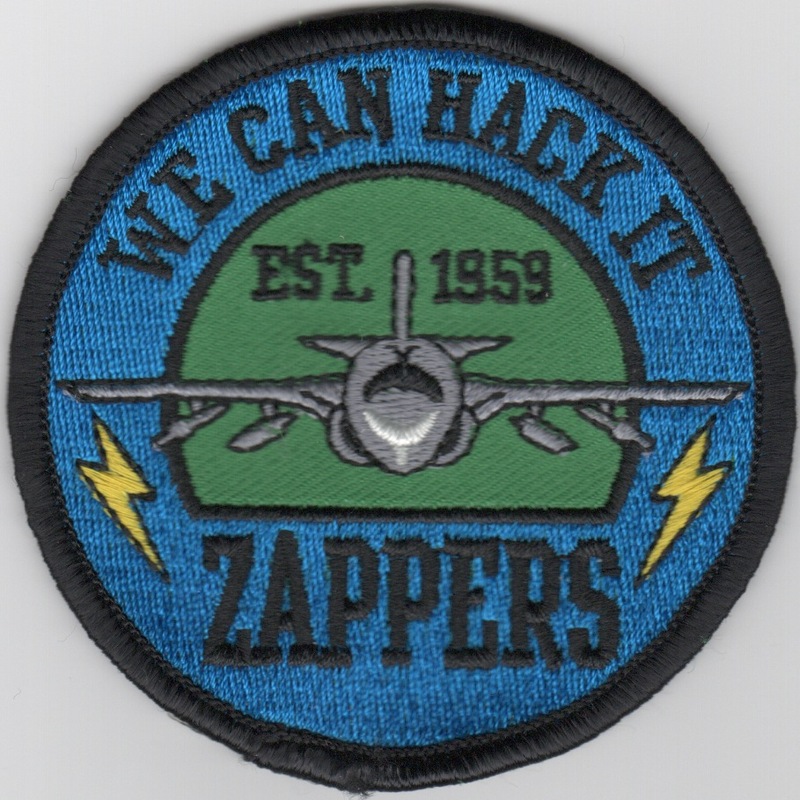 This is the blue version of one of the aircraft patches worn by the VAQ-130 'Zappers' showing the aircraft head on and says "We Can Hack It". 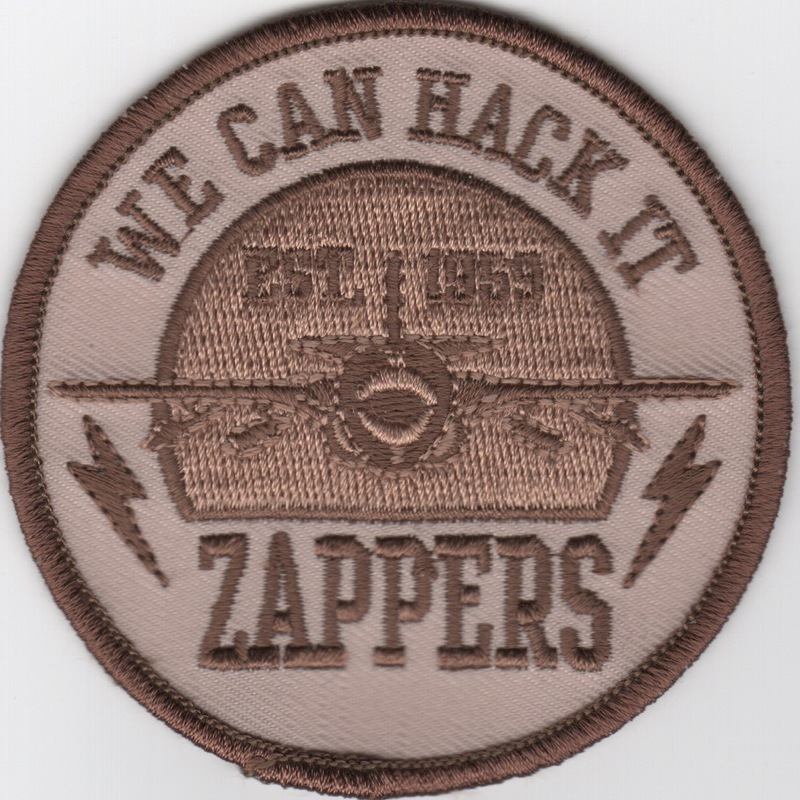 This is the desert version of one of the aircraft patches worn by the VAQ-130 'Zappers' showing the aircraft head on and says "We Can Hack It". 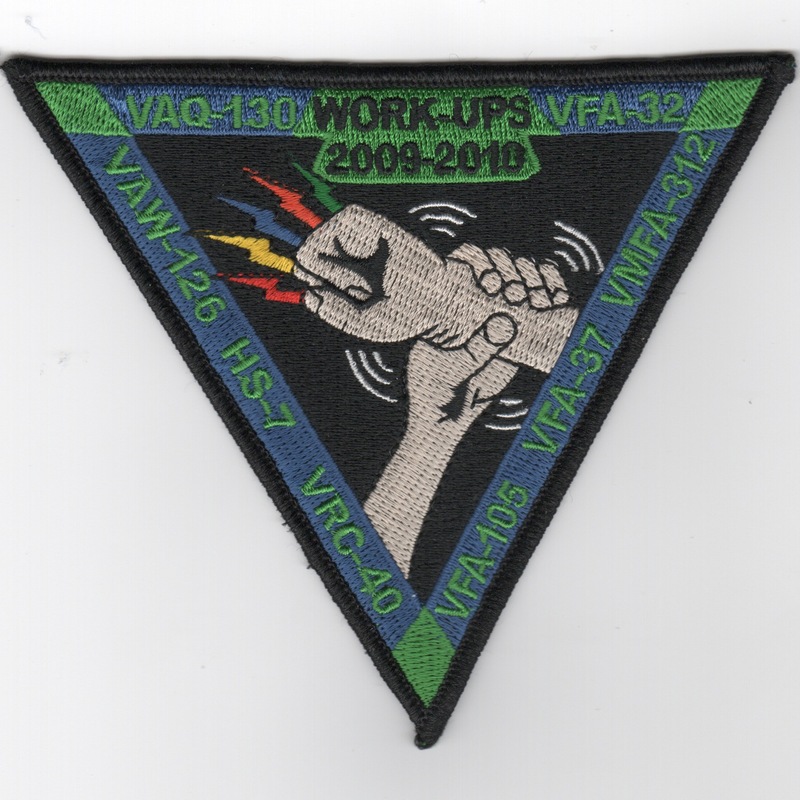 This is the triangle version of one of the aircraft patches worn by the VAQ-130 'Zappers' showing one hand grabbing the other......not sure what that means! 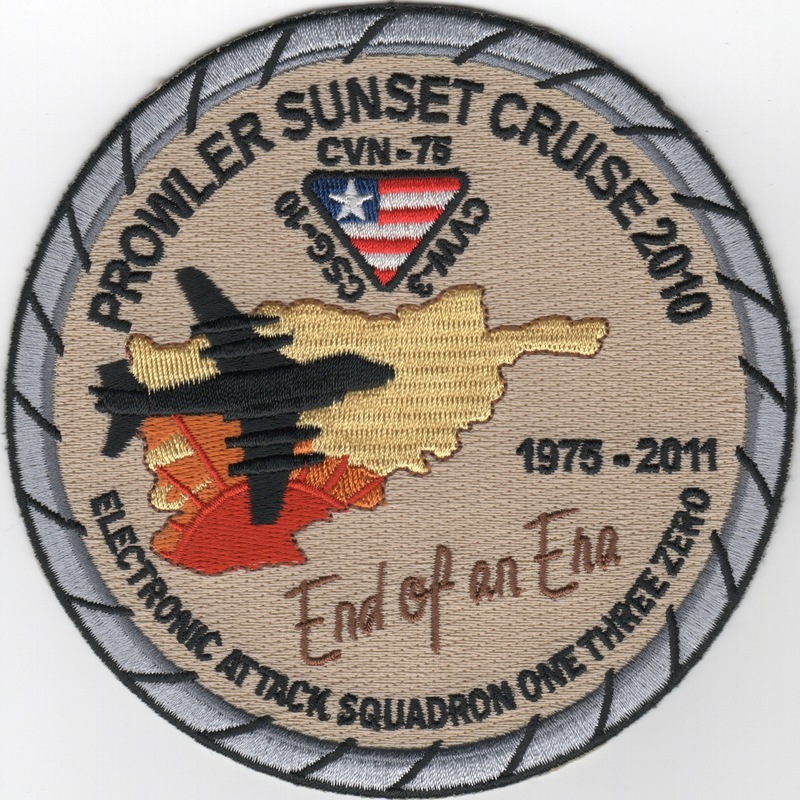 This is the 2010 Sunset Cruise patch for the VAQ-130 'Zappers' that states "End of an Era" and shows the aircraft with a setting sun. The 'Zappers' of VAQ-130 were established as VW-13 in September 1959. They were given their current designation in October 1968 and were the first squadron to operate the Grumman EA-6B Prowler. They fly out of NAS Whidbey Island, WA and were aboard the USS Kennedy (CV-67) with CVW-3 during the Persian Gulf War. 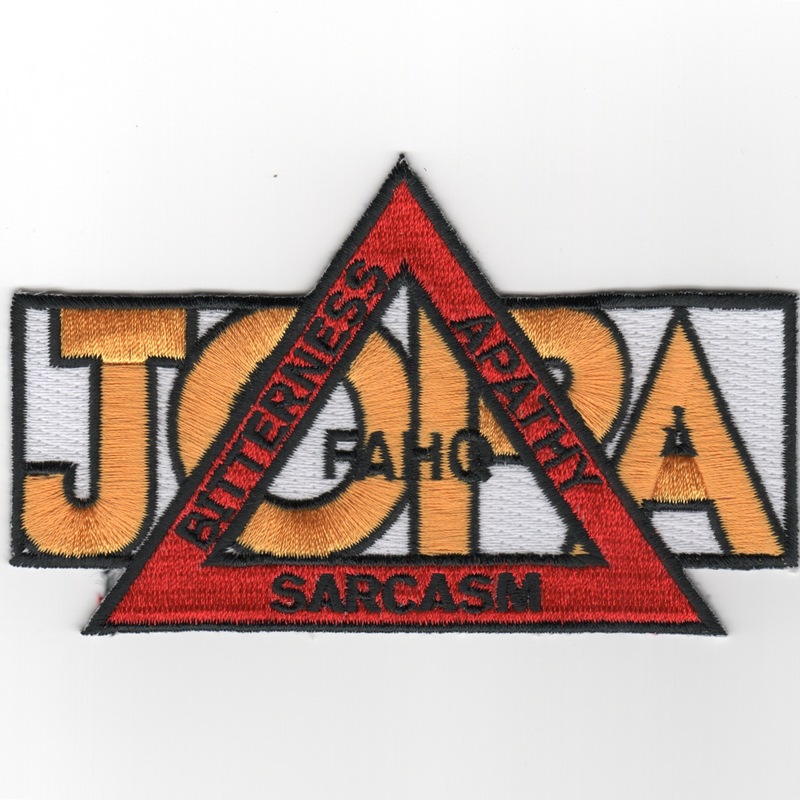 This is their Junior Officer Protection Agency (JOPA) patch and does not come with velcro attached. Homepage | Order VAQ-130 Patches!